The ECOWAS Court was established as a sub-regional international Court in 2001 pursuant to Articles 6 and 15 of the Economic Community of West African State (ECOWAS) Revised Treaty, (subsequently referred to as ECOWAS Revised Treaty). Pursuant to the provisions of Article 10 of the Supplementary Protocol of the ECOWAS Court adopted in January 2005 by the Authority of Heads of States and Government, individuals, corporate bodies and governmental organizations have access to the court for the enforcement of human rights. Thus, by the combined provisions of Article 15(4) of the ECOWAS Revised Treaty and Article 2(1) of the Supplementary Protocol, the judgments of the Court are binding on all the Member States, the institutions of the Community, individuals and corporate bodies. Article 22(3) of the Protocol and Article 5(2) of the ECOWAS Revised Treaty mandates Member States, in accordance with their Constitutional provisions to immediately take all necessary measures to ensure the enactment and dissemination of such legislative and statutory texts as may be necessary for the implementation of the provisions of the Treaty including the execution of the decisions of the Court. By virtue of these provisions, Member States of ECOWAS are mandated to ratify and domesticate the ECOWAS Treaty, protocol and other legal instruments for the effective and unimpeded implementation of the provisions of the Treaty including the enforcement of the judgements of the Court. Thus, any refusal, failure and/or neglect by any member state to implement the above provisions shall not render the judgments of the Courts unenforceable, it thereby lead to depriving a successful party of the enjoyment of the fruits of his judgment. It is important to also mention that the ECOWAS Court in the exercise of its human rights jurisdiction is not constrained by the fact that the ECOWAS protocols have not been domesticated by any given Member States. Nigeria, on the 1st of July, 1994 ratified the Revised Treaty, thus is bound by the judgement of the court by the international law principle of ‘pacta sunt servanda’ (agreements are binding). It is trite that the question of domestication is entirely a local duty of the state to comply with its domestic laws including its Constitution. However, where the action of the State is indicative of the fact that it intends to abide by the contents of the Treaty and proceeded to enact into law the provision of the African Charter on Human and People’s Rights contained in Article 4(g) of the Revised Treaty makes the objection of the 1st and 2nd defendants a non-issue and immaterial. As always, a state cannot approbate and reprobate in respect of domestication of Treaties, that it derives benefits from its application. ECOWAS is a supra national authority created by the Member States wherein they expressly ceded some of their sovereign powers to ECOWAS to act in their common interest. Therefore, in respect of those areas where the Member States have ceded part of their sovereign powers to ECOWAS, the rules made by ECOWAS supersedes rules made by individual Member States if they are inconsistent. The Revised Treaty of ECOWAS was ratified by all the Member States of ECOWAS… this Court is the offspring of the Revised Treaty; and this Court is empowered by the Supplementary Protocol on the Court of justice, which is part of the instruments of implementation of the Treaty and has the same legal force as the Treaty, to adjudicate on issues of human rights arising out of the Member States of ECOWAS. Therefore, it is untenable for a member state of ECOWAS to claim that a matter is essentially within its domestic jurisdiction when it had expressly or by necessary implication granted ECOWAS powers to act solely or concurrently with national jurisdiction in respect of that matter. It is worthy of mention that the concept of exhaustion of local remedies does not apply to the ECOWAS court. The case of Valentine Ayika v. Republic of Liberia was ruled admissible notwithstanding the fact that the case was alleged to be pending before the Supreme Court of the state. Also, by Article 24(4) of the Supplementary Protocol, each Member State is in an attempt to effectively enforce the decisions expected to determine a competent national authority that will be responsible for the enforcement of the court’s decisions in accordance with her own rules of civil procedure. Interestingly, Nigeria has put in place mechanisms for the enforcement of judgments of the court. 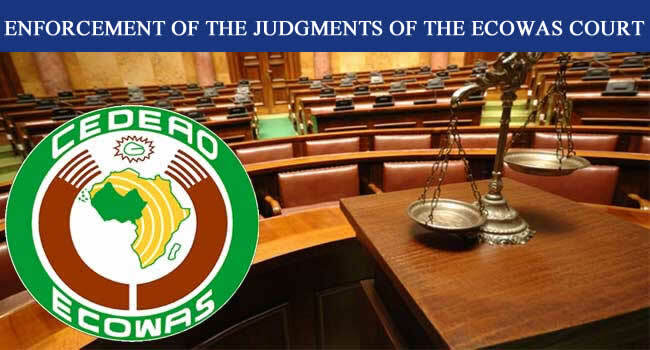 However, enforcement of judgments of the ECOWAS Court has been a major problem and this relates to the fact that neither the ECOWAS Revised Treaty, Supplementary Protocols or other legal instruments make provisions regarding the means of enforcing the issued writ of execution where Member States fail to voluntarily comply with the terms of the judgments of the Court. However, Article 77 of the ECOWAS Revised Treaty empowers the authority of heads of state and government of ECOWAS to impose certain sanctions on any member state who fails to fulfil its obligations to the community through suspension of new community loans or assistance, suspension of disbursement on on-going community projects or assistance programmes, exclusion from presenting candidates for statutory and professional posts and suspension from participating in the activities of the community. This power is however yet to be exercised by the apex organ of ECOWAS. Thus, unless Member States are compelled to comply with the judgments of the ECOWAS Court, the confidence in the Court will completely be eroded so much so that the Court may be unable to entertain any applications from any person in respect of the violations of the fundamental rights of the citizens of ECOWAS. On the question of whether or not the judgment of the court has been enforced by the Nigerian government though a Member State, two cases would be referred to; the case of SERAP v. Federal Republic of Nigeria & Anor and the more recent case of Sambo Dasuki v. Federal Republic of Nigeria. In the SERAP case, the ECOWAS Court ruled that the Federal Government of Nigeria should provide free and compulsory basic education to every Nigerian child but it has not been enforced by the Government though it was a judgment gotten in 2010. Also, in the Sambo Dasuki case, the Federal Government was ordered to release the former National Security Adviser which the Government is still yet to obey. The statement of the Supreme Court in the case of General Sani Abacha & ors v. Fawehinmi is to be noted. The court held that ‘an international Treaty entered into by the government of Nigeria does not become binding until enacted into law by the National Assembly. Also, the provision of the Constitution of the Federal Republic of Nigeria which provides that any law which is inconsistent with any Section of the Constitution shall to the extent of its inconsistency be null and void. Thus, it may seem that the Treaties relating to the ECOWAS Court are not binding on Nigeria as they have not been expressly ratified. However, the position of the Court in the Moukhtar Ibrahim Aminu v. Government of Jigawa State & 3ors case in my opinion takes precedence. Thus, a country like Nigeria should tow the path of honour and responsibility in enforcement of the law whether or not it is in her favour.